Companies have now collected petabytes of IOT data, but are we actually leveraging them to gain actionable insights? Given the scale of this problem, traditional manual approaches don’t work very well in the domain of IOT. This session will talk about real examples where Fortune 500 firms used IOT data and Smart Pattern Discovery to generate real revenue and profit benefits. 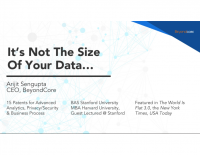 Arijit Sengupta is the Founder and CEO of BeyondCore. 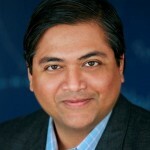 Before founding BeyondCore, Arijit held a variety of technical and management positions at Oracle and Microsoft. Arijit has been granted ten patents in advanced analytics, business process as a service, operational risk, privacy and information security. Arijit has guest lectured at Stanford; spoken at conferences in a dozen countries; and was written about in The World Is Flat 3.0, New York Times, Forbes, Fast Company, Harvard Business Review and The Economist. Arijit holds an MBA with distinction from the Harvard Business School and Bachelor degrees with distinction in Computer Science and Economics from Stanford University.